First, AutomationClinic.com is something I can totally get behind because it works. After just one event, we used the strategies we learned with Jermaine Griggs and, man, did we get results! If you want the highest-level, fastest techniques to automate your business, tune in on Tuesday from 9 a.m. to 4 p.m. PST and get some strategies you can use right away. Plus, you can look forward to a day of insights, guest interviews and a whole lot of fun. I can’t wait to get there! Second, we’ll be streaming Tuesday’s Q & A with J episode as we always do, live at 4 p.m. PST, but we’ll be doing it from Jermaine’s event! It will be a bit different because I’ll be broadcasting in front of a live audience. How cool is that? I’ll be answering your questions and going over deals like I always do, but this time I’m sure there will be questions from inside the room, too. If this goes well, I’m sure you can look forward to seeing more of this type of broadcast experience from us. Hey, it sounds like a lot of fun. I love doing live workshops and events. It is my joy to field questions from all parts of the room. I never know what to expect and it keeps me on my toes. And it never fails that I get to answer new and exciting questions. The relationships I form with members of my audience is phenomenal. That’s what happens when you find solutions to people’s problems, and as you know… that’s what I keep telling you. As an investor, you are solving problems. As a guest at Jermaine Griggs’ event, I know I can look forward to learning a lot and having him answer some of my automation questions. He’s a great presenter and I always learn a great deal from him. He truly knows how to put automation to work to create cash flow, and you know how I feel about cash flow creation. He’s been creating cash flow through automated systems for years! I admire him for all he has accomplished. Recently, Jermaine was a Cash Flow Diary podcast guest. If you didn’t get a chance to hear that episode, do it now. Be sure to read the related blog post, too! Well, that’s it for now. I have to pack and get ready for my trip to Phoenix. Be sure to tune in live Tuesday, April 22nd, from 9 a.m. to 5 p.m. PST for the full day’s coverage. 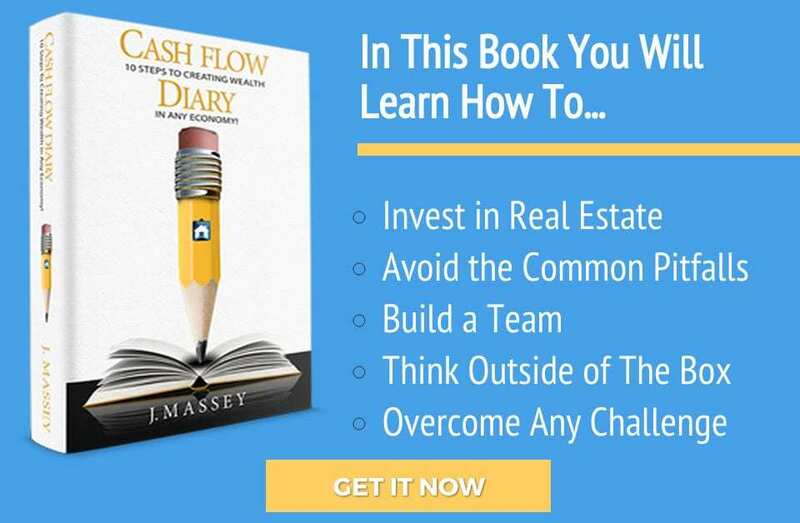 CFD 064 – J. Massey Presents at a Sacramento Investors Event!